This is the recap page for Unbeatable Squirrel Girl #7. 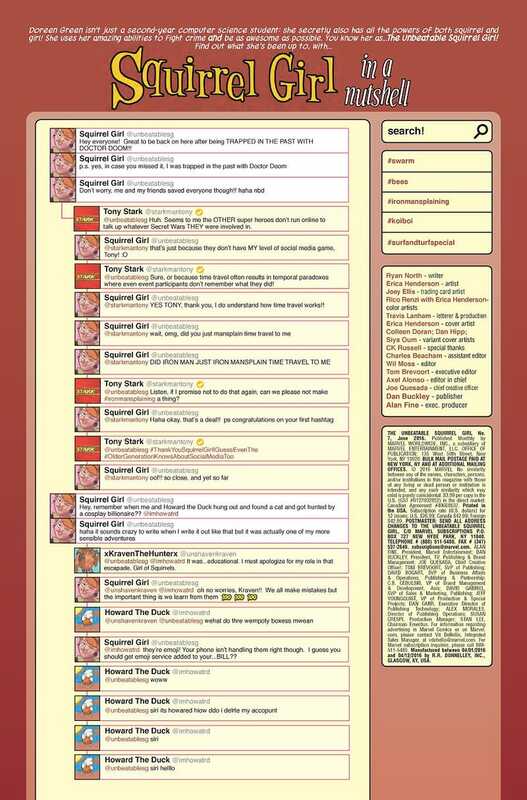 Every recap page for Unbeatable Squirrel Girl is actually Squirrel Girl’s Twitter feed (from her real Twitter account). And it is filled to the brim with jokes. The best one is in this issue: #ironmansplaining. Because, hey, we all know somebody who has Iron Man-splained. a) This special issue, called “BE THE UNBEATABLE SQUIRREL GIRL,” puts YOU in control of THE MOST POWERFUL CHARACTER IN THE MARVEL UNIVERSE. Will you fight crime and save the day? Or will you be a complete jerk and use her powers to tell everyone off? b) I’m serious: these are actual choices, and you have to make them RIGHT NOW? To be Squirrel Girl and fight crime, turn to c). To be Squirrel Girl and be a jerk instead, turn to e). c) Well, you’re in luck vis-a-vis crime-fighting, because Squirrel Girl is going to be facing off against SWARM, a bad guy made out of bees! And that’s not all. To learn more about the other bad guys she can face, turn to d)! But if INSTEAD you’d like to stop reading this and get excited about this book and maybe order it, please: feel free! d) Nice try, but we’ve got to keep SOME surprises for the book! You decide to definitely buy this comic and see who they are. THE END. e) What? No, why would you even want to be a jerk? Geez, man, maybe this ISN’T the comic for you. Turn to b) and answer better this time! If you aren’t reading this book, why aren’t you reading this book?